A leave period usually a year but can be different according to company HR processes. Leave periods can’t overlap, which means if an employee applied for annual leaves in leave period for “Year 2014”, his leave balance in leave period “Year 2015” won’t get affected. This is same for all types of leaves. Also if the leave period for year 2015 is not defined, employees won’t be able to apply leaves for 2015. Leave type tab defines types of leaves which can be applied by employees. 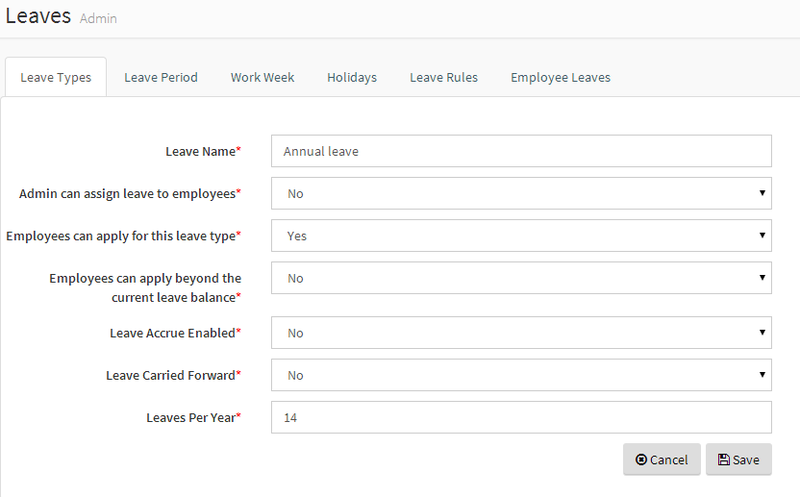 If “Yes” is selected, an Admin or a Manager is able to login as an employee (Please check switch employee concept explained in employee module) and apply this type of leaves behalf of the employee. If “No” is selected; only an Admin or a Manager is allowed to assign this type of leave to an employee. (An employee won’t be able to apply this type of leave). This is the number of leaves can be applied by an employee per year (or the current leave period). If the leave period is less than a Year this is the number of leaves for the leave period. If an employee has some leave balance remaining in previous leave period, that amount will get add to the current leave period. In each year (or period) what percentage of remaining leaves should be carried forward. For how many days carried forward leaves are available in start date of current leave period. Whether the available number of leaves should be calculated based on number of days employee work in a given leave period. (e.g if an employee joined in end of June, he/she will only get half of the number of leaves specified for given leave type. Work week defines the days that your employees are working. When an employee is applying for a leave, work week is taken into consideration. For an example if you company works only from Monday to Friday and if an employee applied for a leave for two continuous weeks including weekends, Saturdays and Sundays will NOT be counted for leave application. In some cases, companies need to keep different workweeks for different countries. 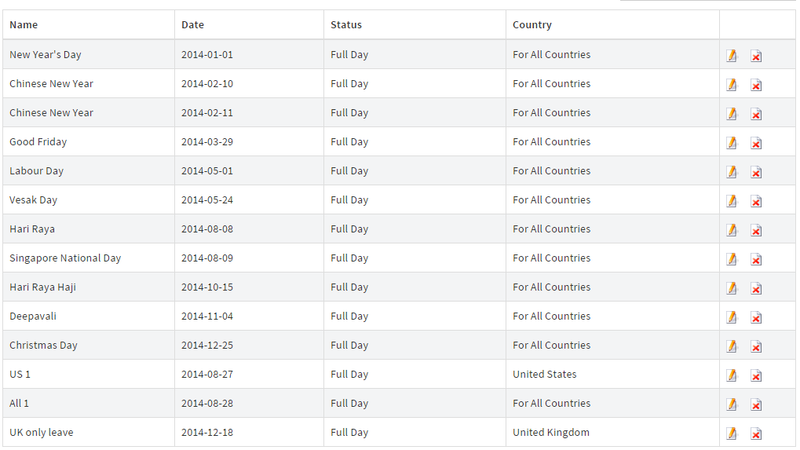 For an example if your branch in UK works a half a day on Saturday then you can add that as shown on following image. 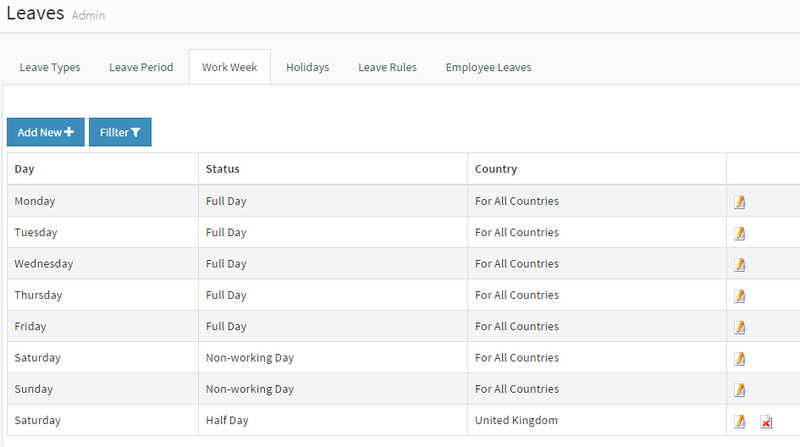 All the leave calculations of UK based employees (employee: country field should be set to UK) will be done according to extended workweek defined for UK. Holidays defines the list of holidays for all leave periods. It is advised to define all holidays for all the enabled leave periods. If an employee applies for a leave which includes a holiday, the leave for holiday won’t be counted. Just like the workweek, you can have different holidays defined for different countries. In following example 2014-12-18 defined as a holiday only for UK. Employee leaves tab lists all the employee leaves. An administrator can view details of leaves and take actions on it (Approve or Reject). Admin should usually use this feature when the Supervisor of the person who applied the leave is not able to do it. All the employees are allowed to check there leave entitlement. It show a summery of their leave balances for the current leave period. Group a set of employees and create leave rules affecting all employees in the group. First create the leave group under “Leave Settings”->”Leave Groups”->”Edit Leave Groups”. The contents of this website are © 2019 IceHrm.com under the terms of the MIT License.